Metrix is our second album. It was recorded between January-August 2001 at Seawolf Studios, Helsinki. After the succes of The Zappa Album we wanted to do a relaxed album with a smaller group, consisting totally of our own music. 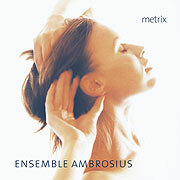 Metrix features a New York-based guitar legend Raoul Björkenheim and eight fresh compositions by Ambrosians Olli Virtaperko and Jonte Knif. Released through our own record label, Ambrosius Entertainment, we need not to compromise in any part of the process of making a record. Sincerely, this cd is far beyond The Zappa Album, as far as recording quality, playing, musicality, layout and the packaging is concerned. Highly recommendable.